Categories: Sold Items, Sold Pocket watches. 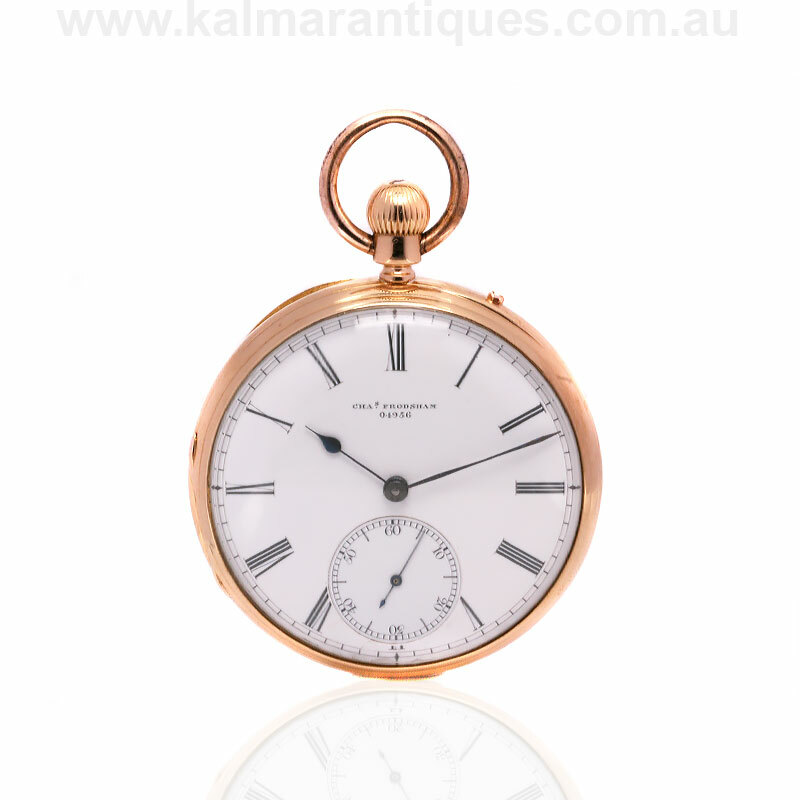 Charles Frodsham was one of London’s most eminent watchmakers, renowned the world over for their high quality movements including chronometers, and here is a very elegant 18ct Charles Frodsham pocket watch made in 1874. Perfect for any pocket watch collector, or that perfect gift for that difficult to buy for man in your life, this antique pocket watch feels just right in the palm of your hand. The 18ct yellow gold case measures 48.3mm across by 67mm from the bottom to the top of the bow. With the white enamel dial still in excellent condition, it displays the traditional form of Roman numerals and has the sub-seconds counter at the bottom. Still so easy to read, it is wound via the crown and setting the hands is done by pressing in the pin at the 1 o’clock position and turning the crown. Inside the signed movement has recently undergone a full service, keeps perfect time and comes with our twelve month warranty. 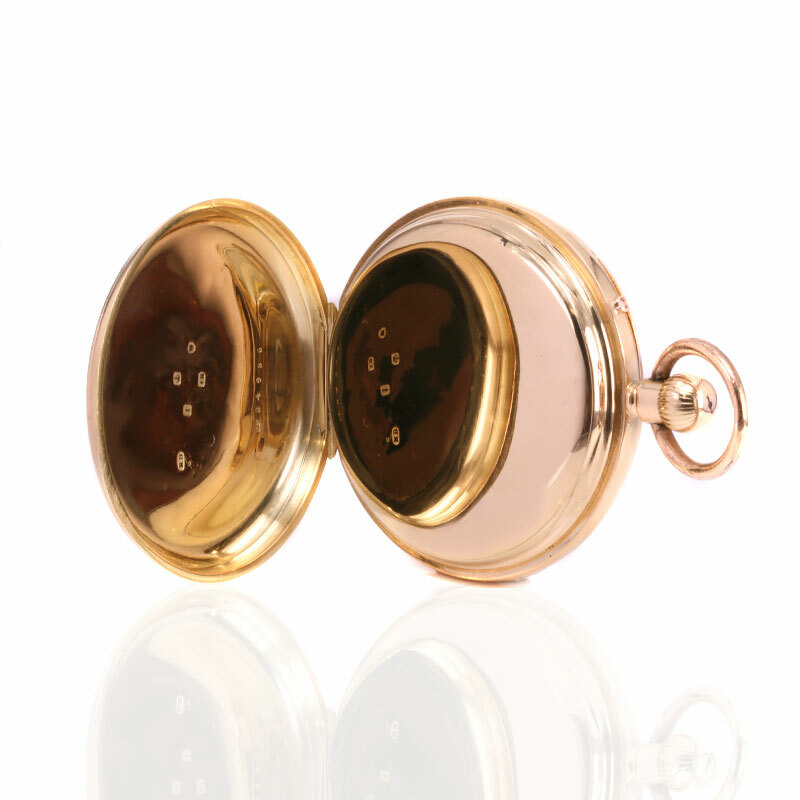 Charles Frodsham pocket watches are known the world over as some of the best to collect, and this one is just perfect in all respects. Tags: 18ct pocket watch, Charles Frodsham pocket watch. Charles Frodsham & Co. are the longest continuously trading firm of chronometer manufacturers in the world, and are synonymous with precision timekeeping instruments of the highest quality. Charles was educated at Christ’s Hospital, the Bluecoat School in Newgate, London, and as a condition of the Foundation, was apprenticed at the age of fourteen to his father William. He showed early promise submitting two chronometers to the 1830 Premium Trials at Greenwich, No.2 gaining the second Premium prize of £170. A further nine chronometers were then entered for trial in subsequent years, until the termination of the Premium Trials, in 1836. Charles commenced business on his own soon after marrying Elizabeth Mill (1813-1879) in 1834. These early years were very productive and it wasn’t long before Charles had established himself as one of London’s leading chronometer makers. Upon the death of John Roger Arnold, Charles purchased the whole of the Arnold business, including the goodwill, and in 1844 moved his business and family into the former Arnold premises at 84 Strand. Trading continued as Arnold & Frodsham Chronometer Makers for a further fourteen years. Soon after acquiring Arnold’s, Charles commenced correspondence with George Biddell Airy, seventh Astronomer Royal. Their detailed letters, which continued until Charles’ death, reveal a mutual respect and contained many solutions to a multitude of horological topics. Amongst these there were discussions on quick trains as advocated by Earnshaw, experimental balances to address Middle Temperature Error, the properties of balance springs, the reversed fusee, galvanic apparatus, Greenwich Mean Time, and the application of Airy’s remontoire to clocks. Charles died on the 11 January 1871 at his home at 26 Upper Bedford Place, and was buried at Highgate cemetery, London, in the family vault next to that of his father. His obituary succinctly stated that ‘during a long and honourable career, he distinguished himself by his devotion to the science of horology, which he greatly advanced, and his clever works upon the subject are regarded as authoritative by members of the trade’. The firm continued under the leadership of Charles’s son Harrison Mill Frodsham (2 Jul 1849 – 24 Sep 1922). The young Harrison immersed himself in horological theory, taking out various patents, and publishing his unsurpassed Some materials for a Résumé of Remontoires in a series of articles for the Horological Journal. From the late 1940s through to the 1980s, the firm concentrated on the production of mantel and carriage clocks, producing amongst other things the ‘Princess’ clock, presented in 1947 to HRH Princess Elizabeth on the occasion of her marriage. In 1977 the Company moved to 32 Bury Street, where it continues today, specialising in English precision horology.